In some recent good news, the Piracy Reporting Centre  (PRC) of the International Maritime Bureau (IMB) noted that the number of recorded sea piracy attacks worldwide was down by a third in the first quarter of this year compared with the same period in 2012: 66 down from 102. For the whole of 2012, the PRC recorded 297 ships attacked—down from 439 in 2011, constituting a five-year low. A major contributor to the drop was fewer attacks from pirates based in Somalia. The international navy patrols are clearly having an effect, as is the number of ships carrying private armed guards. Ships are being more careful about keeping a proper watch in piracy-prone areas and a number of countries appear to have overcome their reluctance to put captured pirates in prison. That doesn’t necessarily mean that the piracy problem is on the way to being overcome. For one thing, not all attacks are reported to the PRC. The owners or managers of the ships sometimes don’t want to draw attention to the fact that they’ve been attacked. If they do, their insurance premiums are likely to go up and they might also be detained in ports while local authorities investigate the attack. It’s probably a safe bet that if the anti-piracy patrols conducted by various navies were withdrawn the pirates would thrive again. How long countries are prepared to lend their navies to patrolling for pirates is anybody’s guess. During one incident of piracy a US navy commander dryly noted that there was one destroyer present for every pirate. (On that particular occasion the pirates still managed to take the ship and collect the ransom). 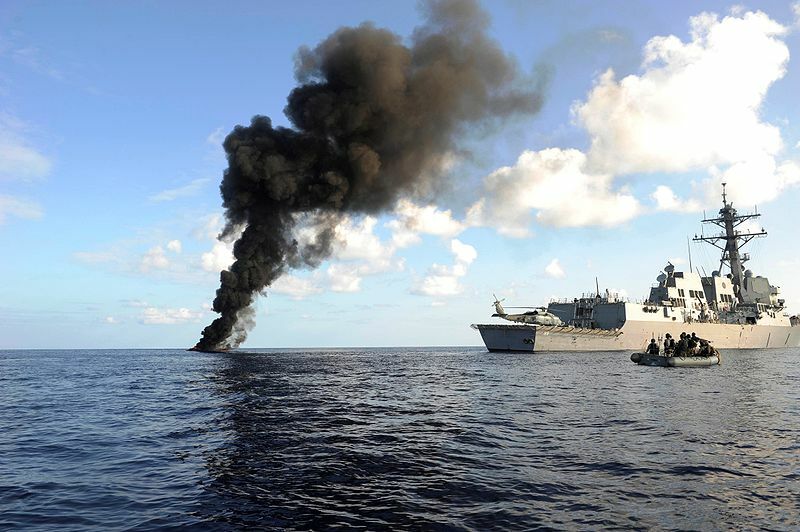 An Australian frigate has been part of the counter-piracy patrols off the Horn of Africa and around the Middle East for about a decade. In its first blue-water deployment, the People’s Liberation Army Navy took part in the patrols. At first the Chinese protected only Chinese ships but later joined in the general patrols, including cooperating with the Royal Australian Navy. At the end of last year senior people from the two navies shared their experiences on counter-piracy patrols  at a Sydney meeting. Next year New Zealand plans to join the patrols by sending a P-3 Orion aircraft  for surveillance. Carrying private armed guards isn’t without its problems. If a ship is within a country’s territorial waters its passage is supposed to be peaceful. Countries conscious of their sovereignty don’t want ships going past with people on board who might shoot a fisherman or someone else suspected of being a pirate. After David Cameron, the British PM, proposed that certain British ships should carry private armed guards, South Africa turned the idea down, saying that it would rather deal with regular British forces on the ships rather than armed guards supplied by a private firm. Identifying a pirate has its own practical and legal tangles. If a naval ship finds a skiff manned by a group of people with AK47s or RPGs and no fishing lines, it’s reasonable to believe that the crew members aren’t catching fish for supper. But it’s rarely as easy as that to decide. Nor do the legal definitions make for open and shut cases. The United Nations Convention on the Law of the Sea (UNCLOS) says that piracy has to occur on the High Seas, not in waters under the jurisdiction of a state, and has to be for private gain. The IMB definition encompasses armed robbery at sea and within harbours and waters under the jurisdiction of coastal states. Piracy off the east coast of Africa, unlike piracy in Southeast Asia, consists mainly of hijacking and holding ships and crews for ransom—a ransom sometimes paid by a ship’s insurers. States are reluctant to ever admit that they pay a ransom. It’s a piracy business model made possible because much of Somalia hasn’t been under any effective government, which allows pirates to take ships to Somali ports to wait until a ransom is paid. The MalaccaStrait, once one of the world’s most piracy-prone areas, now has few attacks—two in the whole of 2012 and nine in the last five years. David Lackey, a New Zealander who once had a yacht attacked in the MalaccaStrait, is convinced that the way to confront piracy is to use Q-ships —the decoy system used against German submarines in the world wars. The submarine would surface alongside the Q-ship believing it to be harmless, but then the disguise would be whipped away and the submarine fired on. Whether such a system would work legally is an interesting question. Indonesia continues to be the most piracy prone of Southeast Asian countries: 81 actual and attempted attacks in 2012 and 25 in the first quarter of this year. Southeast Asian nations cooperate much more on anti-piracy measures than they used to do. Thinking developed within the Council for Security Cooperation in Asia– Pacific (CSCAP ) Maritime Study Group led by Dr Sam Bateman, a former commodore in the RAN and frequent ASPI author, contributed to the increased Southeast Asian cooperation. Japan, long a supporter of anti-piracy programmes, continues to train people in counter piracy measures. Eighty-seven people from a variety of countries, including China, have attended courses in the last five years. Trainees have also come from African countries. But despite all of those positives, piracy is likely to persist. The contributing factors—depleted fishing stocks, the dominance of large fishing fleets and poverty—won’t change. As a result, the present naval patrols and arming of private guards will reduce but won’t eradicate piracy at sea. Stuart McMillan is an adjunct senior fellow in the school of social and political sciences at the University of Canterbury. Image courtesy of Wikimedia Commons .